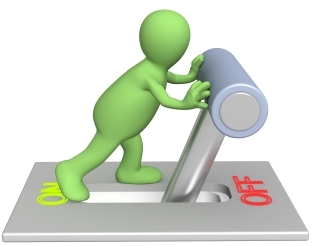 Does your work life have an OFF switch? Since I got into this whole working-for-myself lark, the line between work and leisure has got rather blurred. I now have the flexibility to, say, take Friday off to go and watch a horse show, then catch up with my invoicing on Saturday evening. The thing that worries me is that when I send out work emails late in the evening or over the weekend, I frequently get a reply straight back. The Blackberry (AKA Crackberry) has a lot to answer for. It’s starting to feel like I should only send emails during office hours to avoid interrupting Blackberry (or iphone) owners during their downtime. Thanks to smart phones, wifi and 3G, its quite hard for agency staff to ever really be off duty. Unless you go on holiday to a mobile blackspot (I can recommend Runswick Bay), you are always On Call. It’s not just Planning or Account Handling either – I’ve lost count of the number of times I’ve heard Creatives say that they’ll work on something over the weekend. I was talking to a friend who is a vet recently and she was telling me how she could never really relax when she’s On Call overnight or at the weekend as she’s always on edge waiting for the phone to ring with a challenging emergency call out. The same must apply to an extent to agency types. If you’re constantly checking your email or never let your work mobile leave your side, surely you can never truly relax and rejuvenate, ready to face the challenges of the days ahead. I really think we need to look at how the industry is increasingly demanding its employees to be ‘always on’. Especially as the online world demands marketing input outside the normal 9-5, there is going to have to be some kind of acknowledgement that the human brain needs a break occasionally. Perhaps we should take a lead from my friend the vet’s employers and instigate a shift On Call system to make sure that those who aren’t on call can literally (as well as metaphorically) switch off.